Despite the irrefutable benefits of riding 1x set-up, many riders are still reluctant given their higher prices and limited gear range. 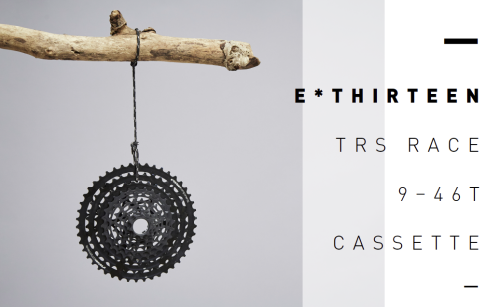 Fortunately, E*thirteen’s new TRS Race 9–46t cassette tackles both issues and looks set to bring 1x to the masses. Weighing in at just 309 g, the cassette’s price tag comes in at the middle of the market at 369 € and has a gear range of 511 % – a figure that was previously only really found on double or triple chainrings. The TRS Race cassette can be mounted on any XD freehub body, and is also compatible with SRAM and Shimano derailleurs. It’s also a two-piece cassette, allowing you to sensibly replace only what’s worn or broken as and when needed.